Wiccans love to celebrate Samhain on Halloween, which is October 31st. 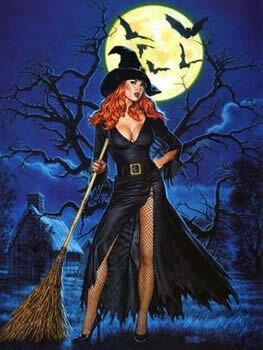 Samhain is generally considered the Witch’s New Year. Samhain stands for the end of summer, and the third and final Harvest. The darkest winter half of the year begins on this Sabbat holiday and Wiccans celebrate the turn of seasons with costumes and festivities. Synonyms for the greater Sabbat known as Samhain are Third Harvest, Samana, Day of the Dead, Old Hallowmas, Vigil of Saman, Shadowfest, Mrtinmas, and All Hallow’s Eve. Happy Halloween! Samhain is normally celebrated on Halloween which is October 31st although some witches prefer to celebrate on the next day, which is November 1st. Samhain is considered one of the two spirit nights that occur each year. The other spirit night is Beltane. A spirit night is so magical because on this night there is a brief interval where the mundane laws of space and time are temporarily suspended. What is known as the Thin Veil between the worlds is lifted during this time. This means that Wiccans can be communicating with spiritual ancestors and their departed loved ones quite easily. Contacting them through spells, rituals, and seance is often done on this particular night. Wiccans take advantage of the opportunity to explore dark mysteries, and contact spirits they wish to communicate with. The Dark Mother and the Dark Father, who are symbolized by the Crone and her aged Consort, can honored on this night. The Feast of the Dead was originally celebrated in Celtic countries. The tradition was to leave food offerings on altars and doorsteps for the wandering dead souls. Witches still carry out that tradition today. You can light a single candle and place it in a window to help guide the spirits of ancestors and loved ones to your home. Treats and decorations such as pumpkins, carved apples, and pies attract the spirits and bring joy to your home. Some Wiccans set a table with extra chairs around the hearth for their unseen spirit guests. Apples and orange lights can be carved and placed along your entry path and steps for spirits who are lost or have no descendants to provide for them. Turnips, pumpkins and watermellon can be hollowed out and carved making them resemble protective spirits. Samhain is such a night of fun, magic and chaos. It is the best time of the year. Elves and fairies became very active on this night, pulling silly pranks on unsuspecting revelers. Traveling after dark away from safe neighborhoods is not advised on this night, nor is running into the road. In the old days people dressed as ghosts in white sheets, or hid in disguises made of straw. Another trick is to dress as the opposite gender in order to fool the nature spirits and throw them off your scent. Trick or treat with friends, dress up with your children, or give out candy and treats! In the old days cattle and livestock were slaughtered for food during the ensuing winter months. If there were crops still left out in the fields on Samhain they were considered as taboo now and would not be consumed. Instead, the unused food was left as offerings to the Nature spirits. Build a fire in your fireplace if you live in a colder area. In days of old, bonfires were built. Did you know that bonfire got the name from bone-fires? After a giant festive feast, the bones and leftover foods never used were thrown in the fire as offerings for healthy livestock in coming New Year. To celebrate an old tradition, you can decorate stones with people’s names and throw them into the fire. In the morning you can retrieve the stones after the fire is out and they have cooled down. Look at the stones carefully. The condition of the retrieved stone foretells the named person’s fortune in the coming year. If the stone survives the fire well, all the better for their new outlook. You fire is also meant to ensure the unity of your family and loved ones. Take the ashes from the celebratory hearth fire and sprinkle them around your property to protect and bless your family, pets and home life in the coming year.